The Great October Strike of 2010 hadn’t begun yet when I flew into Paris on the morning of the 11th, so I was able to catch a super-speedy-smooth TGV train to Lyon right away. 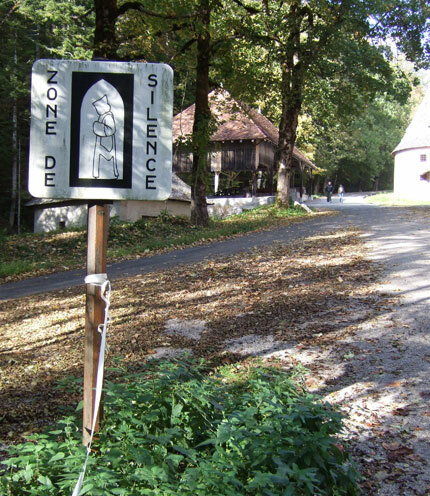 I would spend the night there en route to the distillery at the foot of the French Alps that produces the venerable herbal liqueur Chartreuse. France’s second-largest city after Paris, Lyon is situated amid the comely geography of the Rhone and Saone rivers. I checked into the groovy Hotelo near the Rhone side of things and wandered across the city to the Saone side — the oldest part of the city. 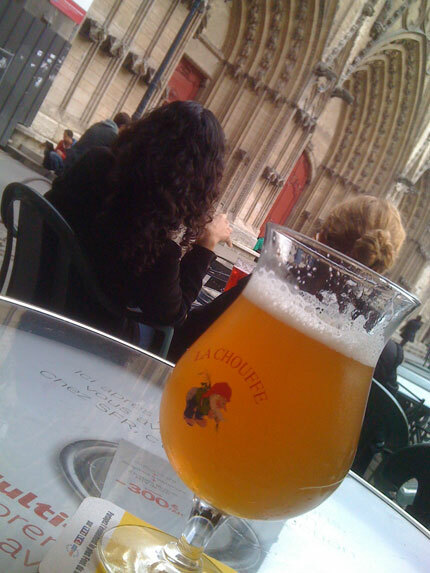 I did the mandatory climb up an endless set of stairs for a view of the Lyon Cathedral and its plaza, then rewarded myself with a La Chouffe Belgian ale at an outdoor cafe in said plaza. Right then it was official — I was on vacation in France! A cab driver suggested I check out Brasserie Georges for dinner. Its largeness and big neon sign (albeit in cool, Art Deco lettering) gave me pause — this place has as much chance of being really cheesy as being really good, I thought. But it was conveniently located right across the street from my hotel… The verdict: really good. 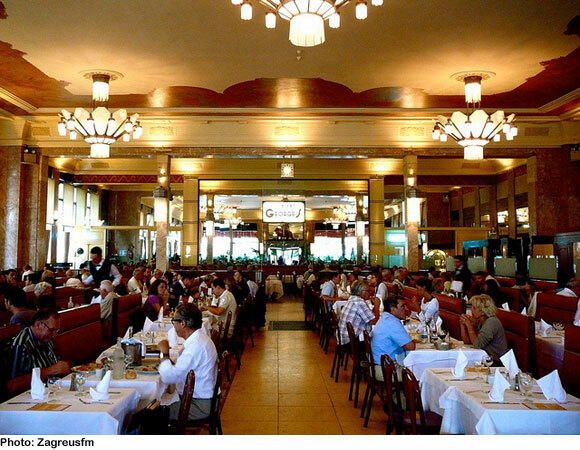 Brasserie Georges is a real brasserie, i.e. 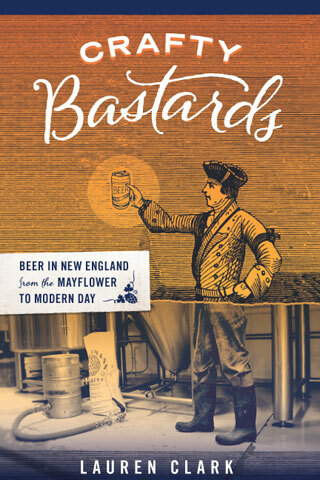 beer is brewed on the premises. I ordered a slightly cloudy, dry Belgian-style amber and enjoyed the hustle and bustle, the hearty regional fare (calf’s-foot and lentil salad, anyone?) and the swift, sure service that all characterize a good, urban brasserie. If you’re ever in Lyon, it’s well worth checking out. 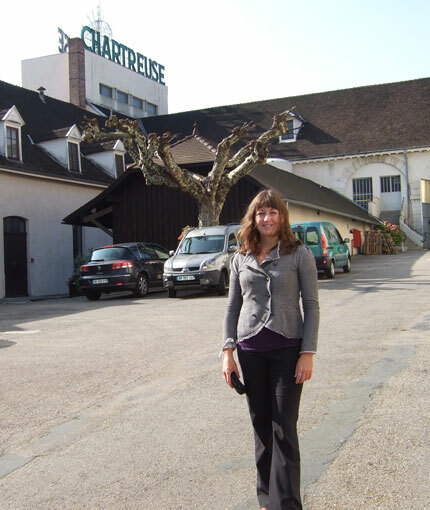 You may have heard that only two brothers of the Carthusian Order — the 900-year-old monastic order that created its “elixir of long life” in 1737 — know the recipe for Chartreuse, which in the green variety involves 130 different botanicals. 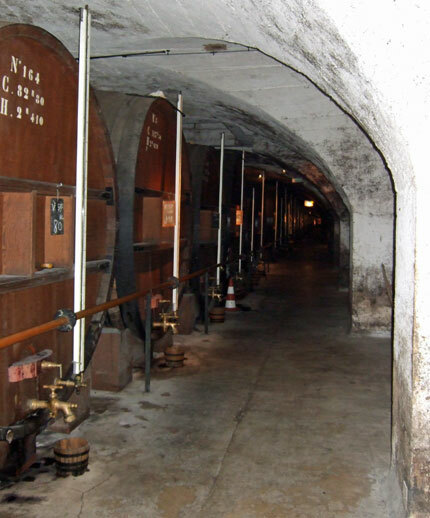 But those two monks, with one helper, are also responsible for producing the entire world’s supply — in part using small, copper pot stills that are 200 years old. Now that is god’s work. It was a treat to sample some special-edition bottles of Chartreuse unavailable in the U.S., including a version of yellow Chartreuse made in partnership with some of France’s noted sommeliers and a version of the green called 1605, an homage to the birthday of the original recipe for the elixir that was perfected 132 years later. The 1605 is an enchantingly dry-ish sibling of the standard green Chartreuse. 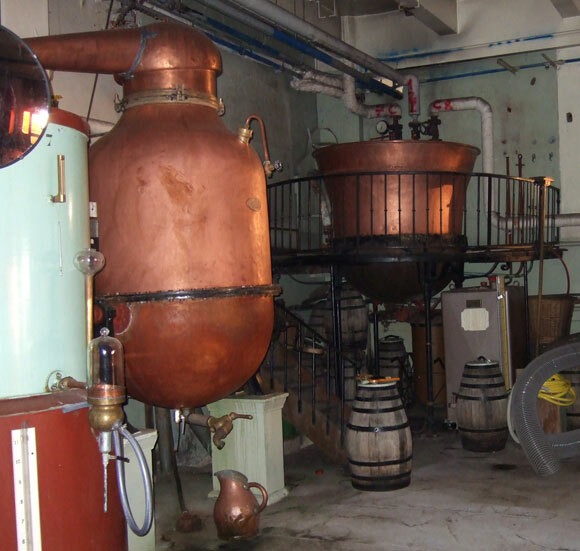 The brothers also produce a line of berry liqueurs that just cry out for sparkling wine and aromatic Alpine specialties like Genepi (which smells similar to Chartreuse and is made from flowers that only grow in the Alps) and La Gentiane (similar to France’s famous yellow, bitter liqueur Suze). 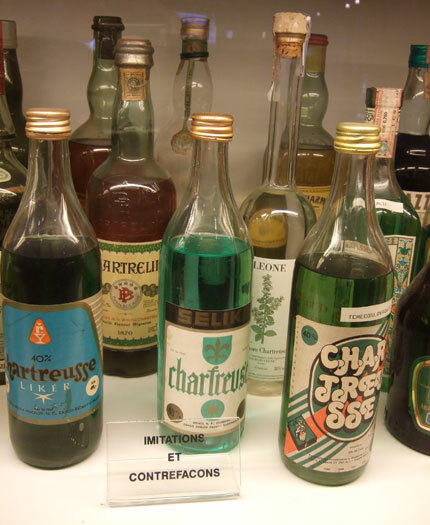 The distillery’s tasting room boasts eye-catching displays of vintage Chartreuse, as well as various “imposter” bottles whose liquid is frighteningly Nyquil-colored. 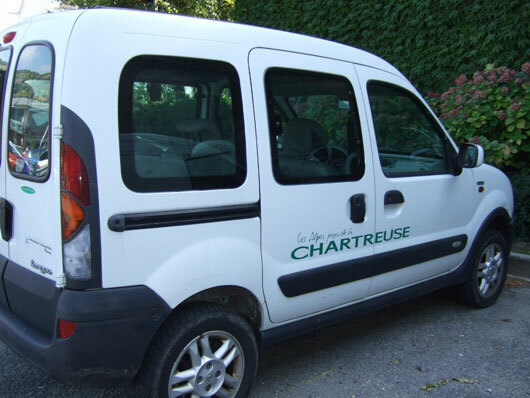 After lunch we drove to the site of La Grande Chartreuse — the main monastery of the Carthusian Order, which has existed on that site since 1084. 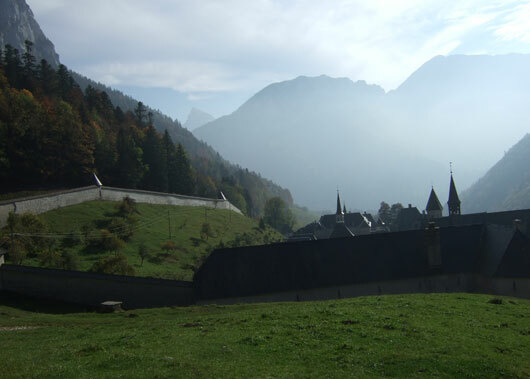 The lower house of the monastery houses a museum, the other (above), a short hike away, houses the hermitage where the brothers live. We took in the view of the hermitage on a little hill bearing a crucifix and waxed philosophical about religion, family and life in general. In the woods below, we spied the occasional white-robed monk walking slowly, contemplatively. Labor strikes and other worldly turmoil seemed very far away. Shake with ice. Twist orange rind over an empty cocktail glass and rim the edge, strain the ingredients into the glass, and drop the peel in. This recipe was adapted by Deep Ellum and published on the Cocktail Virgin.